Although "Eva" is really sci-fi, I needed something for "Fantasy Friday", and it fits this category too. In fact, it's closer to being a "Frankenstein"-esque fairytale than anything else, and for those of you who've noticed a theme going on this month, yes, it's another beautiful Spanish movie. I've been watching more foreign movies recently than ever before due to the lack of decent English language titles, but that will change again next week because I haven't got many new ones left. Not to be confused with Peter Dickinson's YA novel of the same name (which I know you've never heard of! ), "Eva" is about robots rather than chimpanzees, but it still brings up the same questions about life, consciousness, and what makes us what we are. The subject matter is a staple of sci-fi books and movies, so it's not the most original story in the world, and there are similarities to "Bicentennial Man" (1999) and "A.I. Artificial Intelligence" (2001). I'm not going to knock the big Hollywood robot movies which are obviously excellent, but I enjoyed "Eva" just as much as "Bicentennial Man" and more than "A.I. Artificial Intelligence". Apart from a twist which I didn't see coming (but should have done! 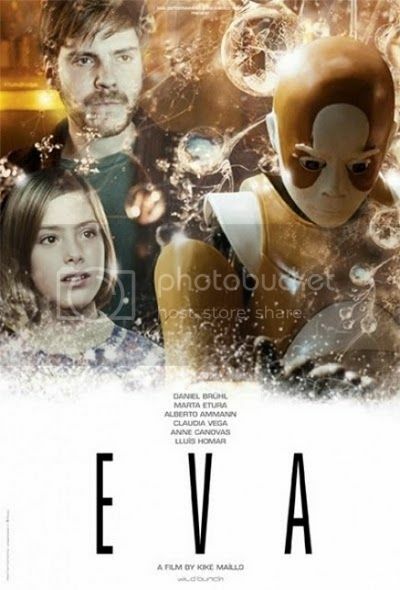 ), there's a cat robot in "Eva" which is outstanding, plus I'm kind of in lust with Marta Etura who plays Lana. If you don't know who she is, check out "Sleep Tight" (2011) and "Los Últimos Días" (2013). Marta Etura and Claudia Vega. Detractors may say that "Eva" is too slow, overuses long shots, and the characters don't have much depth, but I disagree. There are no pacing problems, and the cinematography is very good indeed. The characters could have been fleshed out a little bit more, especially in the case of Alex Garel (played by Daniel Brühl) who is a bit boring even for a scientist, but there's enough made of them to tell the story. Bearing in mind that a 20 minute prologue (which is included on the Spanish Blu-ray) was removed to give more emphasis to the twist, the characters weren't originally so flat. As "Eva" isn't set that far ahead in the future, there aren't too many weird effects used except at the robot lab and every time Alex runs his computer program. Some people may find that disappointing, but I didn't. Less is more, as they say, and the snowy location covers a multitude of sins. There are plenty of robots if you look for them including little horses, dogs, more traditional machines, and, of course, the cute prototype 519. Channelling Robin Williams slightly, Lluís Homar undoubtedly steals the show as creepy servant-robot Max. His menace is a total red herring though and is completely unintentional. In this movie, it's the "free robots" that you have to be careful of. Horror fans will notice several similarities to "Splice" (2009) but without the incestuous implications. Claudia Vega who plays Eva isn't as sexualised as some reviewers suggest despite a couple of scenes which might make you wonder. 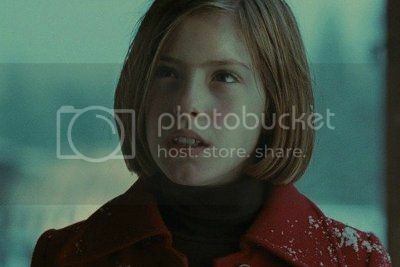 If anything, she comes across like a nicer version of the little girl in "Sleep Tight", and her use of age-inappropriate dialogue is meant as a clue to her secret instead of turning her into another Esther from "Orphan" (2009). I can't say any more about that without spoiling the movie for you, but it doesn't take a genius to work it out. According to a rumour on the IMDb, the Weinsteins will be distributing "Eva" in the USA later this year. In what format, I have no idea, but I expect there will be a dubbed version for the hard of understanding, and an inevitable Hollywood remake eventually. For now, I recommend importing the English subtitled Blu-ray from Amazon.